Cyclones are one of the older sub-species of Minmtar Battlecruiser. Tamed early during the settlement of New Eden, the Cyclone has long been a sturdy, but simple workhorse. 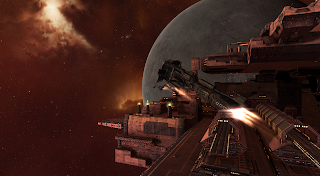 However, recently crossbreeding with Caldari stock has introduced a missile based turret system as the expense of increased size. Mild natured, the Cyclone is stoic in nature. A calm, patient spaceships, Cyclone's are willing to stalk their targets often imitating other, more docile spaceships. Although they can function alone, in warfare, Cyclone's excel at group operations, working well with each other. They are also highly tolerant of frigates and unlike Hurricane's and other spaceships who favor larger sized medium projectile turrets, the Cyclone has few concerns around frigates, making it more ideal for newer owners. Once highly versatile, the change in the breeding program for domesticated Cyclones has caused the domesticated species to become a more focused, task oriented spaceship. It must be noted that the phenomenon known as 'Space' is dark for a typical human eye which will respond to wavelengths from about 390 to 700 nm. In terms of frequency, this corresponds to a band in the vicinity of 430–790 THz. It is believed that spaceships have a similar visual range as humans. Vision is a secondary consideration considering the abundant nature of sensory input and may be a vestigial remnant of an earlier evolutionary state. However, the Cyclone has an extremely large set of forward illuminators suggesting a nocturnal or deep-space origin. It may have used its massive, forward array to find prey cloaked in asteroid fields. Notes from Uncle Travelling Space Noob: The Cyclone solar panel fringe is rumoured to be an adaptation of an earlier threat mechanism, called a hood, commonly found in snakes, a common planetary reptile form. Originally raised only to ward off predators when threatened the environment of New Eden where threat is permanent has resulted in a permanently raised hood on the Cyclone. Rumours persist in low sec bars of other snake based ships, such as the Cobra, the Fer-de-lance and the Asp. Most dismiss these rumours as elements of an early VR capsuleer training environment.